Hey, y'all! I have such a cute project to share with you today! As a Southerner, I LOVE monograms. I'm not the only one because I've seen lots of people in my small town recently wearing monogrammed scarves, t-shirts, sweatshirts, and even boots. I have been in a few stores that sell monogrammed t-shirts, and the price for the shirts was just too much for me. When Silhouette had a big sale around Christmastime, I ordered some glitter heat transfer material. I've been itching to use it, and it dawned on me recently that I more than likely could put it to use to make an inexpensive monogrammed t-shirt. I tried it, it worked, and I want to show you how to make your own. Stick around until the end of the post to see links to some other awesome Silhouette projects. 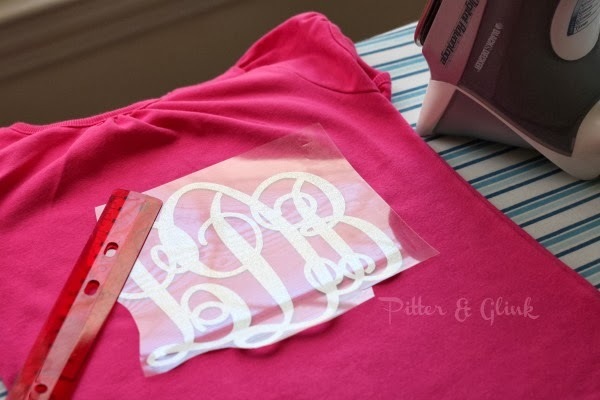 You only need two supplies to create your own monogrammed shirt. You'll need a t-shirt (if you use a new shirt, be sure to wash and dry it) and heat transfer material. The first step to creating the shirt is to create a monogram with your Silhouette program. It's really easy to do. 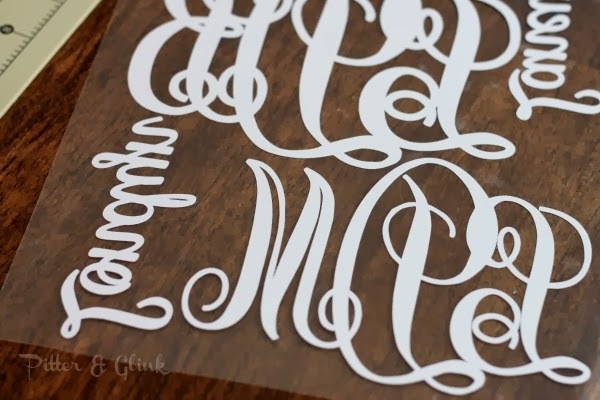 You need to download a monogram font if you don't already have one. I used Monogram KK, which I downloaded for free from dafont.com. Then follow these steps. 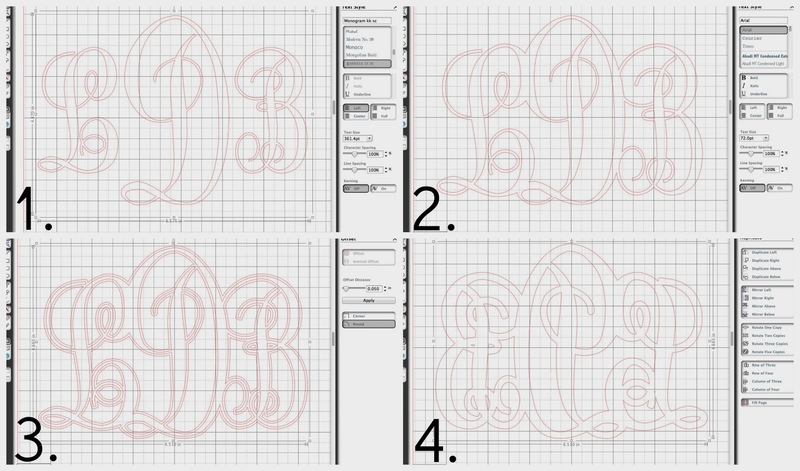 Open your Silhouette program and type your monogram. Remember that it goes in this order: first name initial, last name initial, middle name initial. If you type all this in the same text box and capitalize the middle initial, the font will automatically size the letters for you. Ungroup the letters and move them around and/or resize them until you like the way they look. Then weld them together. Offset the welded monogram. (Why? Because sometimes the little thin "squiggles" are hard for the machine to cut.) Delete the original monogram so that you're left with the offset one. 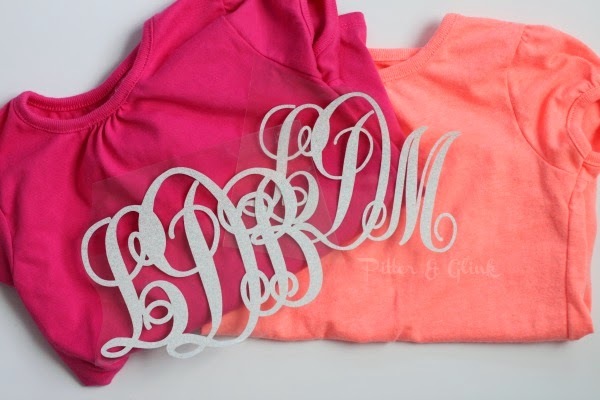 Mirror the monogram so that it won't be backward when you iron it on your shirt. 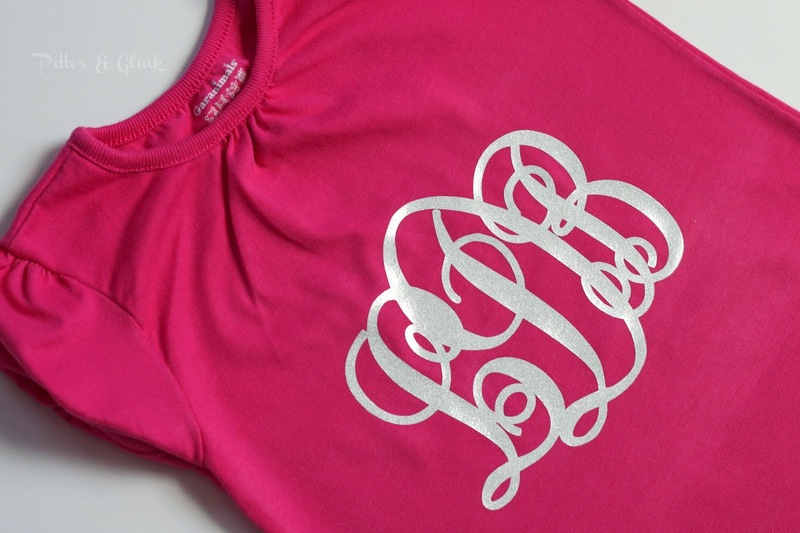 After you've created the monogram, cut it from the heat transfer material (shiny side down) with your Silhouette. When cutting the Silhouette brand glitter heat transfer material, I used a speed of 5, thickness of 10, and my blade set at 4. (I was using a fairly new blade.) To make sure those settings are correct for your machine and material, always do a test cut. Then you'll need to weed. What's weeding? Just removing the excess heat transfer material. Silhouette makes a weeding tool. I don't have one, so I just used a straight pin for the tiny pieces. Cut the monograms apart if you cut more than one like I did. After you've ironed on the monogram, peel of the clear film, and your shirt is complete. 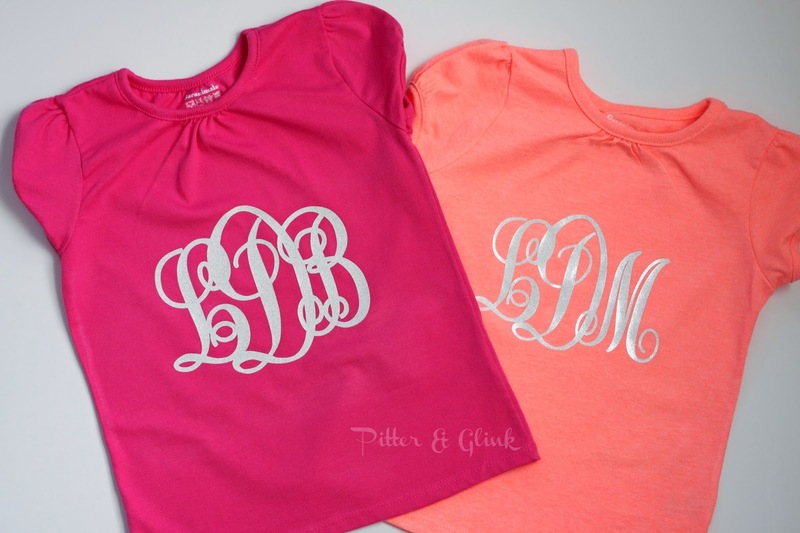 I made two different monogrammed shirts: one for each of my nieces. The shirts were only about $4 each. I used a very small amount of the heat transfer material, so the total cost to make each shirt was about $6. That's much cheaper than the monogrammed shirts sold in stores! And now to share some other projects with you! 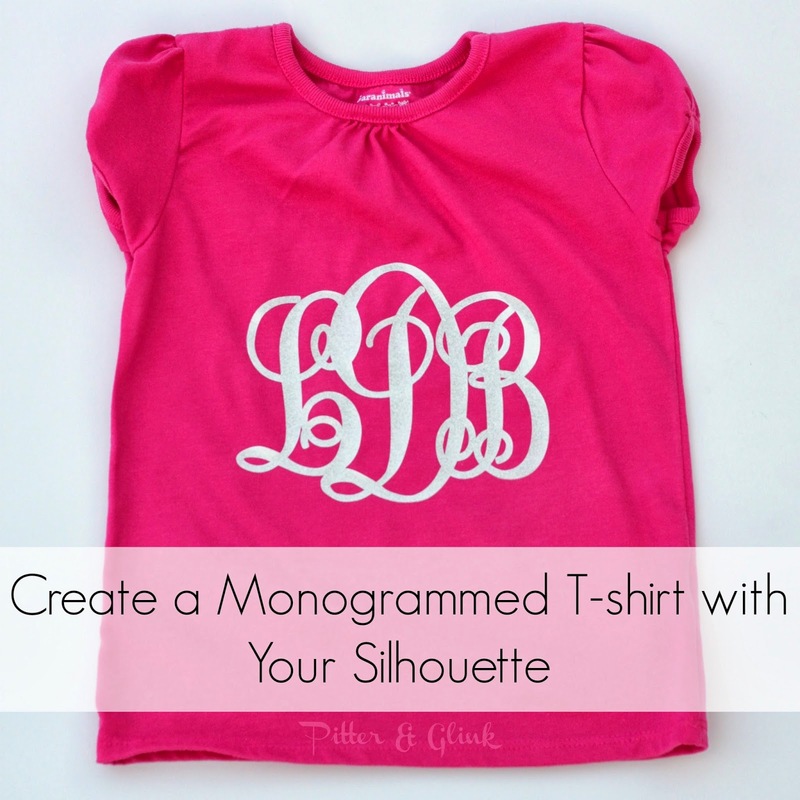 My monogrammed t-shirts are my contribution to this month's Silhouette Challenge. The month's theme is fabric, and there is so much inspiration from my bloggy friends! Peruse the projects below for a wealth of Silhouette fabric projects! These look so classy! Your nieces will love them! How you make it look and sound so easy, I'll never know. Every time I try to do a Silhouette project, I get so frustrated! The monograms look great on the T Shirts. The Silver Glitter really sparkles against the vibrant colours. 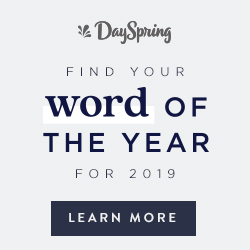 What a beautiful idea, and it would make a great gift too! Lovely shirts! Very nice tutorial for those of us who haven't tried this yet. Thanks. Those are SO cute!! Where did you get the plain shirts? I love the colors! So adorable! I ordered a Silhouette for myself at Christmas and have yet to sit down and play with it. Your monogram just tipped the scale for me. Thanks! Hi, Michele! I have only used the heat transfer material on tshirts and on a hat, and all of those were made mostly of cotton. 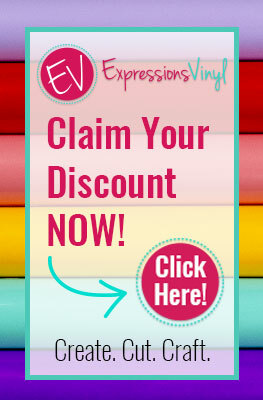 I would definitely suggest checking out Expressions Vinyl. That is where I always get my vinyl from. 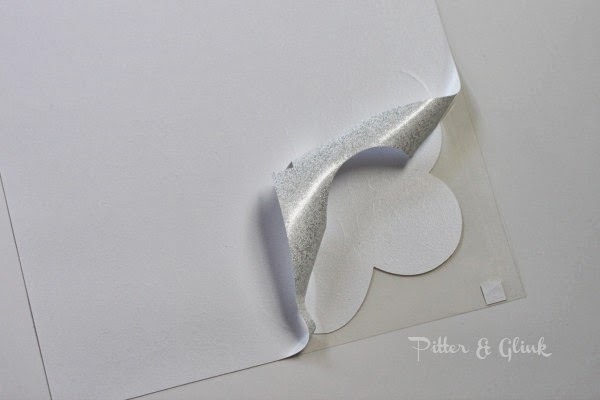 You can buy sheets of vinyl instead of a whole roll, and I believe you can even buy samples. Their customer service is second-to-none, and I believe they could answer lots of your questions. Hope this helps some!